Champagne is widely acclaimed as the wine of celebration. During the early years of its history, the wine had a royal and a religious significance. The Catholic monks, who owned most of the vineyards, considered Champagne to be the only wine worthy of being offered to God. Later, the French kings began using it for their coronation ceremonies. The king of wines, the most widely known, and the beverage accompanying celebrations, the wine for the best from the French territory of champagne. The distinctive taste and the wonderful tickle in your nose tell you that that sparkling liquid in your hand is champagne. This sparkling wine gets its name from Champagne, a grape-growing region of France, which has been famous for its vineyards ever since the Middle Ages. Although it is believed that the Champagne wine is the result of an accidental discovery of the process of second fermentation. The history of champagne goes back about 300 years. Some records give the credit of making the first Champagne to a couple of French monks Frere Jean Oudart (1654-1742) and Dom Pierre Perignon (1639-1715). However, the two monks were more concerned with the removal of bubbles from the fizzy wine because they felt that a bubbly wine lacked dignity. Although Dom Perignon and his companions did not succeed in removing the bubbles from Champagne, they did succeed in developing a set of techniques that are still relevant in the modern process of making Champagne. During the early part of its history, Champagne fascinated kings, czars, aristocrats, clergymen, and those belonging to the upper tiers of society. However, it soon became popular among all social classes. By the middle of the nineteenth century, the sale of sparkling bubbly had reached 20 million bottles. 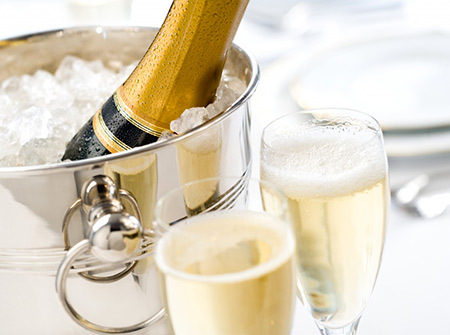 Many sparkling wines bear the name ‘Champagne’ on their labels. However, the authentic Champagne comes from the grapes grown in Champagne, a region in France that comprises 70,000 acres of lush, beautiful vineyards. If it comes from any other part of the world, it is just sparkling wine and not the real Champagne. Champagne can only be called champagne if it is made in France and that too only in the champagne region of France. The grapes for true blue blooded champagne must come only from the soil of France, giving it a distinctive champagne taste. The other sparkling wines made in other ways and other parts of the world are simply referred to as sparkling wines, this does not in any way indicate that they are inferior or superior to champagne, it is just a name given. The world has produced some excellent sparkling wines beside champagne. The strictest French laws govern the production of champagne, not only must be be made from the grapes of the champagne region, but the process is also defined, a wine made from a different process is not called champagne. The traditional method of making the beverage is champenoise. Methode Champenoise is the traditional method of making Champagne. The wine is first fermented and bottled. A second fermentation is then induced within the bottles by adding yeast and rock sugar. This basic method is followed even today, although each brand has its own secret recipe and variations in the process. The unique orchestrated taste of champagne comes from the three types of grapes put in it, chardonnay, pinot noir and pinot meunier. Each of these lends its flavor in a distinctive way to produce the blend we call and hail as champagne. The grapes are carefully pressed to release the juice before the blending, the grapes are pressed, but the skins or color or other bitter qualities are not allowed to mix with the juice. The juice is then fermented individually, and then kept aside either for blending or for aging depending on the wine to be made. The first fermentation being over, the winemakers will then mix or blend the juice from three different grape varieties to make the base wine or cuvee. The winemaker may according to his skill and the type of champagne he wants to produce may mix aged samples as well as samples from different vineyards. In some case samples are up to the count of a hundred of the three types of grapes. Charmat is the technique now mostly used for the second fermentation, it is effective as it reduces the time and the expense needed to produce the wine. It is also often referred to as the tank method. The other method or the traditional method is used only in case of making true blue blooded champagne, it has to make sure that the champagne is allowed to ferment in small bottles instead of a huge tank. It is time consuming and extremely laborious. The bubbles are produced in the wine after the second fermentation. The blending of the grapes also requires the various wines to have more yeast and sugar, and that makes sure that the bubbles are formed, these bubbles unlike the cola fizz are not aggressive and short lived, but tingle the tongue and are soft. 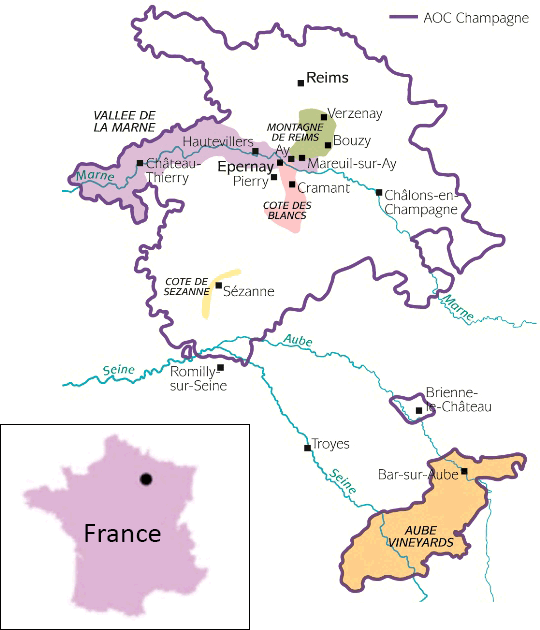 At present the number of champagne houses stand to approximate a hundred, and innumerable smaller vignerons in the region of champagne. The employment in the huge champagne industry is approximately 32,000 hectares of land and 10000 people. The way champagne can be identified is by the label on the bottle of the beverage. The abbreviations flowed by an official number will tell us all we want to know about the beverage we are about to drink. NM: Négociant manipulant. They simply buy the grapes and make the wine. CM: Coopérative de manipulation. These are companies who make the wines from thir own grapes, they are cooperatives and pool the grapes for the wine. RM: Récoltant manipulant. This means that the wines are made from grapes grown by the producer himself. SR: Société de récoltants. This is shared made champagne, it is not a cooperative, but the champagne is made by sharing grapes. RC: Récoltant coopérateur. This is cooperative, making champagne by cooperative but selling it under his own name. MA: Marque auxiliaire or Marque d’acheteur. This is a brand name, maybe of a supermarket and has nothing to do with grapes and growing and making of the wine. ND: Négociant distributeur. selling under his own name of a wine merchant.